…can you maintain that diet forever? How will you feel about yourself if you slip-up? Will you throw in the towel two weeks into the New Year? Will you end up binge-eating on the foods you’ve chosen to eliminate? Will you ultimately end up feeling any better about yourself? I’ve certainly had my fair share of drastic New Year’s pledges in the past, but if I’m being honest with myself, they never made THAT MUCH of a difference in my overall year. 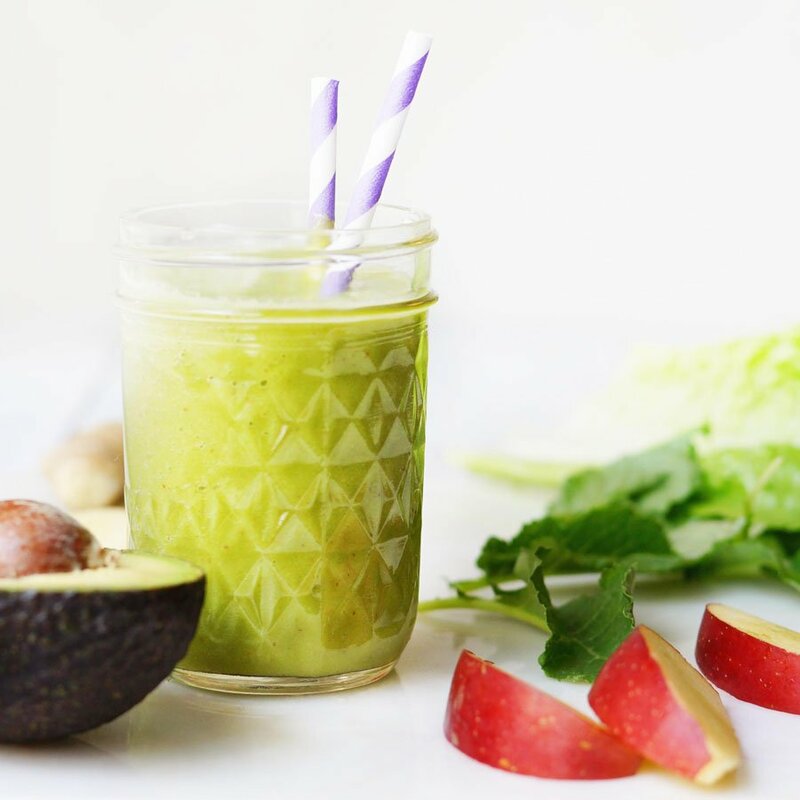 Even when I did a whole month of juice fasting until dinner (which to be honest, sounds pretty drastic to me now), it didn’t really leave me with any habits I wanted to maintain– in fact, I was pretty sick of green juice after that and didn’t drink it for quite a while afterward. Looking back, I know I would have been much better off by making a resolution to simply add a green juice or smoothie to my daily routine. That would be a habit that I could keep up for life, making my overall health better in the long run– not just for a matter of 30 days. The more you practice something, the more permanent it becomes. Whatever you choose, I’ve included a printable challenge calendar to help you stay accountable each day for the next 4 weeks. Click on the image below to get a PDF you can save and print. I’ll be printing mine off and putting it on the fridge as a reminder of my goals for the new year. As you’ll see on the challenge calendar above, I’ve included two places for you to write each day– so you can keep track of both goals separately. I usually use the top one for a healthy eating goal and the bottom one for my workout goal, but you can use those spaces however you like. 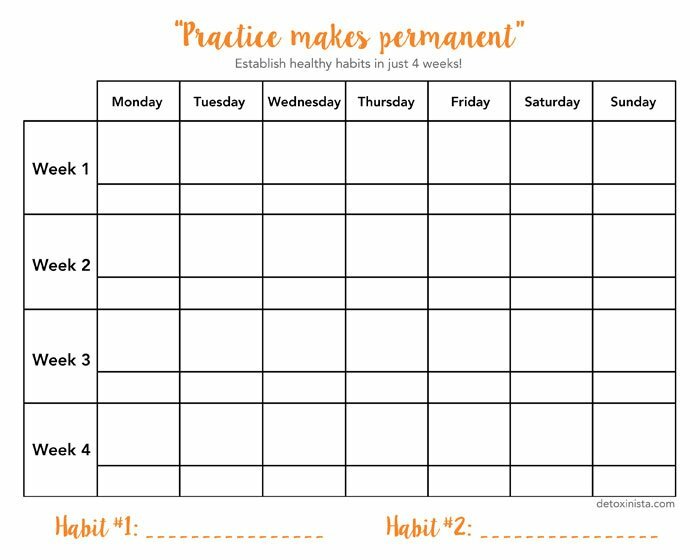 You can also remind yourself of the two habits you’re working on by listing them at the bottom of the chart. I hope this little challenge helps you feel empowered as you enter the new year! If you feel like you need a little more guidance, be sure to sign up for my email list to get your free 21-Day Kick Start Program. When paired with the meal plan in my cookbook, you’ll have 28 days of complete clean-eating meal plans to follow, along with hundreds of easy recipes. Or, if you’d prefer even more structure and slightly faster results, without doing anything drastic, join my Winter Detox Program which will kick off again on January 4th. It includes 21 exclusive cold weather recipes to help keep you warm and cozy while reaching your health goals, along with an exclusive online forum where you’ll get support from me and fellow participants. You can sign up for that here. I know that’s a good thing to do for my body. Hello and Happy New Year, I was looking on this site but i cannot find out to get the glass water bottle for only 5 bucks? if mentions to read below to find out but i cant see where to go? Thanks about suggesting more water. I am a colon hydrotherapist and i do understand the importance of drinking water regularily but with the holidays i too had more wine then normal and less water i feel it and you are right it will help rid of all those toxic beverages that i had for the holidays. Thank you! I’m also looking for the brand you mention all the time on your web site on the raw goat cheese. Whole foods is coming to my area but not for another year. Is there a place to buy it on line? I have downloaded the 21 day kick start and bought the cookbook. Looking for more protein to add to my after morning workouts along with the morning recipes from kick start. Any suggestions? Hemp hearts are a great source of complete protein– I add them to my smoothies each morning! You can also go with eggs/omelets or have leftovers from the night before. I’ve been known to have soup for breakfast when it’s cold outside! I can’t do the salad every day permanently. But I love my daily green smoothie and 30 minute walks. I used to think I could never eat a green salad everyday ~ I grew up in a family that never ate much salad or veggies (Nilla wafters & lucky charms, yup yup). And now, I am able to eat a plain green salad almost everyday without needing any dressing. Sometimes, it amazes me how adaptable we can be!! Walking the dogs every day for 20 minutes in the one I’m going with as it benefits both me and the dogs so much. I have 2 dachshunds and they will love this vow =) Thanks for the practical take-home message.